IN SPRING 2010 with family and friends I visited the Flinders Ranges in South Australia. Just prior to this trip I'd just been the Alice Springs in the Northern Territory (see my report Alice 2010) and I was intrigued to see how the Flinders Ranges compared with the MacDonnell Ranges, especially considering all the rain that the arid lands of central Australia had been having. I wasn't let down. This trip also contrasted sharply with a previous trip to the area, mainly because the Flinders Ranges were totally green! And purple. Due to large areas of the invasive Salvation Jane (Echium plantagineum). Salvation Jane is a name particularly used in South Australia, while Victoria we tend to call this plant Patterson's Curse, and in its native Europe it's known as Purple Viper's Bugloss! Australia. Also known as Salvation Jane. The Flinders Ranges are located 450 km north of Adelaide, and have a wide range of habitats including dry woodlands, mallee, and rivers and creeks lined with River Red Gums. We had driven in from Melbourne stopping at Hattah-Kulkyne National Park and then Broken Hill on the way up; and on the way back the Clare Valley and northern Wyperfeld National Park. Like the MacDonnell's the Flinders were similarly stunning, particularly in terms of the greenness of the place, and the wildflowers. The native pine forests before Wilpena Pound were carpeted in green grass, looking more like a pine forest in Germany, and the Triodia grasslands were all flowering. While there I was fortunate to find a single flowering Sturt's Desert Pea (Swainsona formosa) at Wilkawillina Gorge. It is an amazing experience to stumble across this plant in the wild in an unexpected situation. Spring had bought a carnival of colour to the ranges, with many flowering plants and birds celebrating another breeding season. Although I'd visited the area a few times before I thought I'd chase down some of the Parks specialist species such a Short-tailed Grasswren, Elegant Parrot, Redthroat and Chirruping Wedgebill to name a few. Flinders Ranges 2010: looking more like a German pine forest than arid Australia. While in the Flinders Ranges, once again I stayed at Willow Springs Station, located 21 km north east of Wilpena Pound. A great camping site, all the campgrounds here are without exception excellent. I remember Graeme Chapman wrote that Willow Springs 'preferred' campsite in the Flinders - which sums it up. We stayed in the campground at the end of a line of five campgrounds, spaced about 300 metres apart. There's also a campground situated at the base of the Stokes Hill appropriately called the "Grasswren Campground" (it doesn't get any better than that!). Basically Willow Springs is an excellent place to base yourself to see Short-tailed Grasswren. Grasswren Campsite at WillowSprings - a birders campsite if there ever was one! ﻿The bare spinifex covered slopes at the Stokes Hill Lookout is one of the most reliable places to look for Short-tailed Grasswren - sometimes locally known as Flinders Ranges Grasswren. Once considered a sub-species of the Striated Grasswren, it has evolved sufficiently to be considered a separate species, differing by having a shorter tail and the black-moustache is broken by white-streaking. The turn-off to the lookout is 13 km north of Wilpena and then another 2 km to the lookout. 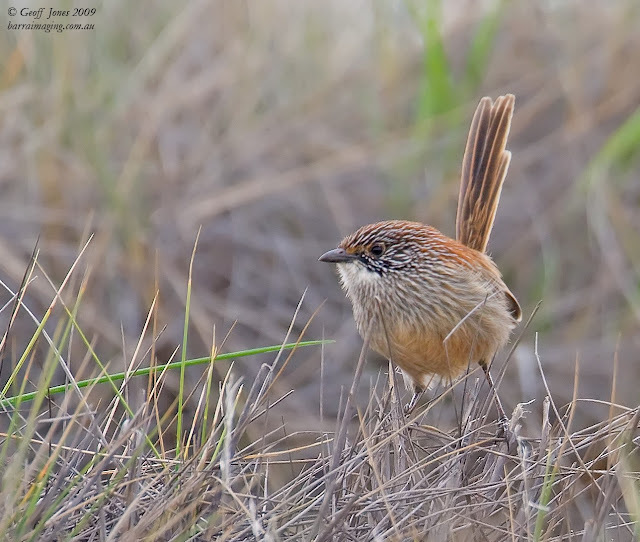 Short-tailed Grasswren is found over most of Stokes Hill, although they are reliably seen west of the ridge-line northwest of the car park. From the top of the lookout I headed south-east to a fence line 200 m from the top and the walk down and followed the fence east for about 500 m. On the north side there is a small valley sloping down (you can see the top of the hill on your left side). Search amongst the Spinifex and Xanthorrhoea grasstrees in the gullies 50 m to 200 m from the fence. I found a pair within 30 min or so. I also saw Short-tailed Grasswren nearby on the Appealina Ruins Track, which is north of the turnoff to Willow Springs, 5.5 km north of the Stokes Hill turn-off. They were in the flatland immediately beside the road about a kilometre from the turn-off. They were extremely forthcoming and at one point a family of Grasswren even crossed the road. This is the area immediately in front of the "Bounceback: Bush Bird Barometre" signage. Along the creek near the ruins I also saw Redthroat, and at both Stokes Hill and the Ruins, several flocks of Elegant Parrot flew through. At Willow Springs there was a couple of birds of interest. One was Crimson Rosella, here there was an interesting subspecies known as subadelaidae, a yellow-orange mix between the 'Yellow' ssp flaveolus and 'Adelaide' ssp Adelaidae. The Australian Ringneck in the Flinders is also fascinating, being in the hybrid zone between 'Port Lincoln' ssp zonarius and 'Mallee' ssp barnardi, having features of both, being slightly dull, but having a black head. Other birds around the campsite and up and down the creekline was (in no particular order) Southern Whiteface, Variegated Fairy-wren, Rufous Whistler, Collared Sparrowhawk, Brown Goshawk, at night Southern Boobook and Australian Owlet-nightjar, Inland and Yellow-rumped Thornbill, Weebill, Little Corella, Striated Pardalote, Red-capped Robin, Tree Martin and Spiny-cheeked Honeyeater. Red Kangaroo, Western Grey Kangaroo and Euro (a short-stocky kangaroo) were also common at Willow Springs and Stokes Hill. Euro preferring upper-slopes, Red Kangaroo the open plains, and Western Grey Kangaroo lightly wooded areas. At the start of the drive into Stokes Hill and Willow Springs you’d usually see Brown Songlark and Emu. The 3 dominant plants at Stokes Hill: Velvet Potato-bush (Solanum ellipticum), Onion Weed (Asphodelus fistulosus), a weed from the Mediterranean, bordered by Spinifex (Triodia pungens). Three kilometres north of Willow Springs is the turn-off to Wilkawillina Gorge – along Wirrealpa Rd and then Wilkawillina Gorge Rd. Wilkawillina Gorge is a Red-gum lined creek-bed and gorge, surrounded by ridges and hills covered in Callitris. Along the river before the gorge there were large pools of water after the rain. 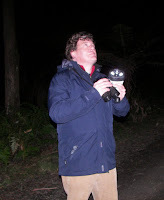 The birds here were excellent, reminiscent of the gorges of central Australia, and a number of similar species. Birds around a large waterhole between the carpark and the beginning of the gorge included Red-backed Kingfisher, Elegant Parrot, Rainbow Bee-eater, Peaceful and Diamond Dove, Little Corella, Rufous Songlark and Striated Pardalote. Little Woodswallow was common at the beginning of the gorge, along with Tree Martin hawking at the top of the cliff faces. Little Woodswallow is uncommon this far south, being the southern extreme of its range. 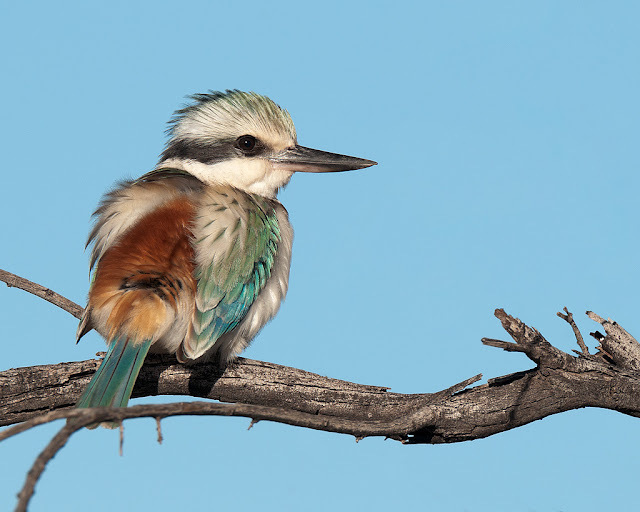 It was really nice to link up with this bird – it was a feature of the gorges of the MacDonnell Ranges. White-winged Fairy-wren was seen in the moonscape area immediately north-west of the creek-line just before entering the gorge. Sturt's Desert Pea (Swainsona formosa) - surely one of the worlds most beautiful wildflowers. There’s an easy 10.8 km walk along the gorge, called the Mt Billy Creek Trailhead. Birds seen along here included a few Grey-fronted Honeyeater and Redthroat; as well a single Yellow-footed Rock-Wallaby, some Red Kangaroo and Euro were common. 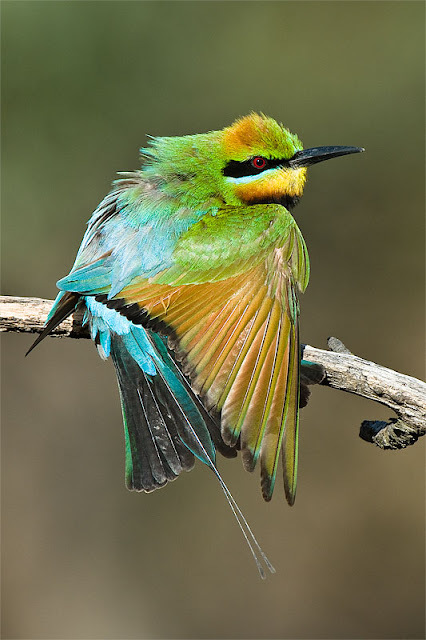 Other birds seen included Wedge-tailed Eagle, Australian Raven, White-browed Babbler, Grey Shrike-thrush (there wonderful call reverberating up and down the gorge), Yellow-throated Miner, Spiny-cheeked and White-plumed Honeyeater. Also along the gorge, on a small ridge line there was flowering Sturt's Desert-Pea – as mentioned it was fantastic stumbling across this plant in the wild. Appealina Ruins Track: in 2010 Short-tailed Grasswren were common here, regularly crossing the road. In the area between 8 km and 12 km from the turnoff to Wilkawilina Gorge there's a nice section of mallee with some patches of Eremophila, with a particularly good area for birding between the two crossings of Mt Billy Creek. 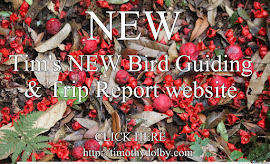 Birds seen here included Mallee Ringneck, Mulga Parrot, Grey-fronted, Yellow-plumed, White-plumed, Variegated Fairy-wren, Crimson Chat, Weebill, Masked and White-browed Woodswallow, Grey Butcherbird and Red-capped Robin. I also found Chirruping Wedgebill 5 km down the 7 km Wilkawillina Gorge Track, in areas of scattered bluebush, wattle and saltbush, as well as Southern Whiteface, White-winged Fairy-wren and some Crimson Chat. Wilpena Pound is dominated by areas of native pine, mallee woodland, heathland and River Red Gums along creeks. Surprisingly one of the best areas for birds was near the information centre, where there were Apostlebird, Yellow-throated Miner, Striated Pardalote, Australian Ringneck, Crimson Rosella (ssp subadelaidae) and Red-rumped Parrot. The Mount Ohlssen Bagge and Drought Busters walks were particularly rewarding, with unexpected finds being Shy Heathwren and White-fronted and Tawny-crowned Honeyeater (the northern South Australian limit for this species), seen when taking a wrong turn in the track, and heading into some scrub on the side of the gorge. Also along here were Inland, Chestnut-rumped and Yellow Thornbill, Red-capped Robin, Singing, White-plumed, Brown-headed, Spiny-cheeked, Yellow-throated Miner and Red Wattlebird White-winged Triller, Brown Treecreeper, Spotted and Striated Pardalote, White-browed Babbler, and Grey Butcherbird. Brachina Gorge was washed out when we were there, however a brief stop at the eastern end produced Elegant Parrot, Redthroat and Variegated Fairy-wren, White-browed Babbler, Southern Whiteface, and honeyeaters such as Spiny-cheeked and White-plumed. Parachilna Gorge, 10 km east of Parachilna, produced Redthroat, Variegated Fairy-wren, White-browed Babbler, Spiny-cheeked and Singing Honeyeater, Zebra Finch, Peregrine Falcon and Black-fronted Dotterel, Dusky Woodswallow, Rainbow Bee-eater, and in the flat areas on Wilpena Road just 2 km east of Parachilna there was Chirruping Wedgebill. The trip back to Melbourne was via the Clare Valley, known for its Riesling. It was also where I watched the 2010 Grand Final draw. Disappointing, but only for a week, when the mighty Pies stormed home. Of real interest in Clare was the number of parrots - if anyone has wondered where they've all gone in Victoria it's here, in South Australia. Some of the parrots seen included Purple-crowned, Musk and Little Lorikeet, Red-rumped Parrot, Australian Ringneck, and the Adelaide subspecies of the Crimson Rosella (ssp. fleurieuensis). Interestingly this was the fourth significant subspecies of the Crimson Rosella I'd seen for the trip - which include 'Adelaide' (two subspecies - fleurieuensis and subadelaidae), 'Yellow' (ssp. flaveolus) and, of course, Crimson Rosella (nominate ssp. elegans). On the way home I stopped off at northern Wyperfeld where the wonderful Mallee parrots were on the birding agenda. Around the Casuarina Campground alone I saw ten in total - Galah, Major Mitchell and Sulphur-crested Cockatoo, Cockatiel, Little Corella, Mallee Ringneck, Regent, Mulga and Red-rumped Parrot, and Blue Bonnet. Not bad. In the last month I'd done trips to two of the great mountain ranges in Australia, the Flinders Ranges and the MacDonnell Ranges. Both were green, with the rivers full of water. 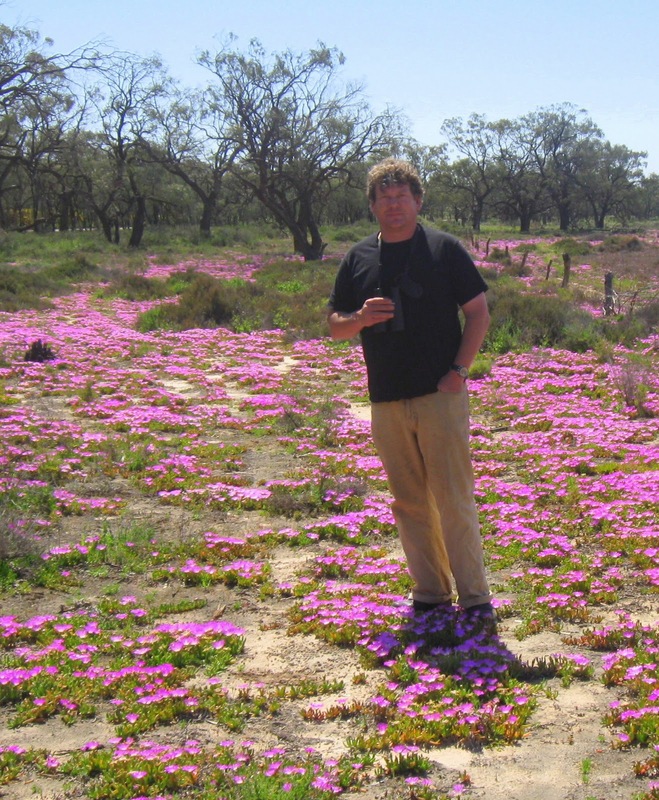 There was also an abundance of native grasses and wild flowers, such as the wonderful Sturt' Desert Pea in the Flinders Ranges and the Upside Down Plant in MacDonnell Ranges. As a result there was lots of wonderful, such as Grasswren and ground feeding parrots. If you have time, you need to get inland as soon as possible. A campsites track at Willow Springs.